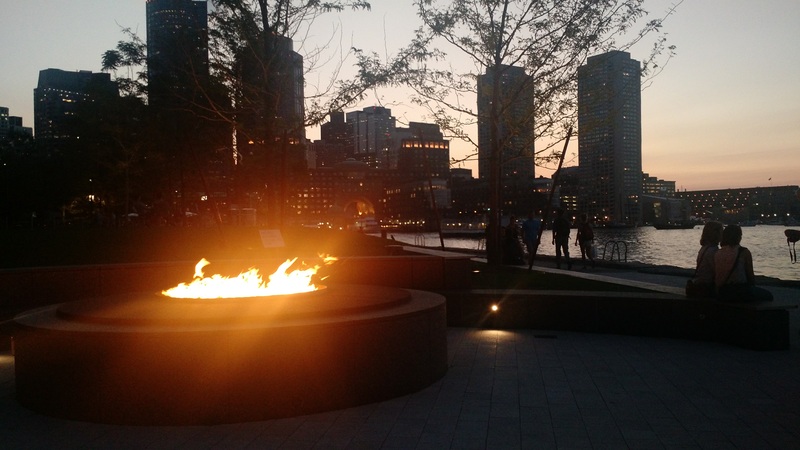 A random Boston photo – city skyline with a public fireplace. Awesome! Between 11 and 19 August 2017 I was in Boston (USA) for the OSGeo foundation’s FOSS4G conference. To write a one sentence summary of the event? It’s like a cornucopia of open source geospatial ideas, applications and inspirations! Variously the event has been compared to disneyland, summer camp, and a few other things. It’s my second round of FOSS4G and I have only this to add: Most of my working life right now is defined by things I learned at FOSS4G 2016 – and my experience this year has compounded/grown/inspired even wilder ideas to implement. It’s going to absolutely consume my waking/working hours. The event really is that good! My attendance is funded by my employer (Australia’s National Computational Infrastructure), on the basis of a talk on point cloud data services using open standards. This makes my life hard because NCI has fingers in many geospatial pies, and as one human I need to cover my own domain expertise, plus things-of-wider-organisational-interest. However, it’s OK and I am very grateful to be able to travel across the world to talk shop. I hope I do a reasonable job of representing my workplace as well! The beauty of going to the conference is that I can look at the program and try to find people to talk to face to face, or representatives from their organisations. I also get to survey the scene and figure out which talks I really need to watch later. Talks are all recorded, and made freely available later (I’m waiting eagerly for this year’s crop to arrive). So let’s dive into what floated my boat. Please bear in mind that in general, the standard of idea presented at FOSS4G is really high! So don’t be disappointed if you didn’t make this list – it was really hard to filter what to see, and my list of catchup videos to watch is long. I played with fundamental spatial algorithms in Python, I was comforted in my old age using GDAL on the command line, bash scripts and awk; my mind was blown using geonotebooks and geopyspark, and I got to play with Digitalglobe’s GBDX tools for an afternoon. Unfortunately this conflicted with LIDAR processing in GRASS, and I will definitely step through that one when I can. I really also wanted to do one on cartography, but that’s too far out of my day job for work to pay for. In short, the workshops were amazing, educational, and delivered by people with deep expertise. My own workshop proposal did not get up, but hey – I am an OSgeo minnow compared to the leviathans I got to go and learn from. So workshops – yes – do. As many as you can! These are all awesome. Paul Ramsey’s keynote on the economies of free and open source software. I really liked it, because I could some new ways of thinking about how I interact with the OSgeo ecosystem in a productive way. I’m a trader in the attention economy, and dive a bit into the giving economy – and I’m feeling a lot less guilty about not being able to write c++ or contribute financially. However – the cash part is still important – while software is given away, it is totally fair to not be taken advantage of. Maria Aria de Reyna on diversity in tech – this is really important and applies to all our lives. The more we talk about diversity the harder it is for bigotry to take root. Everywhere. In tech, walking down the street free of harassment, going shopping without raising eyebrows, even taking a piss in the toilet that is right for you – many of these things are taken for granted by some of us, but needlessly difficult for others. Even though the FOSS4G community could do better, I contrast it with an AWS summit I went to recently, and… well… that community has more work to do than the OSgeo ecosystem. Planetlabs – I went to see two of their talks – amazing to see so much done with relatively simple tools – GDAL, python, stuff literally glued together as they go. And it works! Their successful operational model is a massive, massive thumbs up to the OSgeo ecosystem. Helena Mitasova on viewsheds, vsual complexity and other higher order products using the GRASS GIS ecosystem. I really liked how her group is working at the type of ideas that marketers or social scientists think about – I’m always way too far down in the weeds, and this talk filled me with ideas. Claire Porter on the ArcticDEM project. I appreciated her really down to earth presentation style and obviously deep knowledge – and it’s also an amazing project! To finish the week off, Maria Aria de Reyna on cats. or was it metadata? metacats? But yes – the point: making data infrastructure useful for everybody. I’m on this bandwagon a lot, but nowhere near as succinctly, expertly or cat-ly. Why do all this OSgeo stuff in the first place if we can’t find and use data, right? …and more. Tom Holderness on PetaBencana, Dan Joseph on DIY drone mapping, Hoard Butler on the epic and seminal Proj.4, and .. well .. almost everything. At a high risk of repeating myself I’m really waiting for the videos to turn up – and go through my review list – there were many talks I could not get to in person! This is really important. From my point of view I didn’t see this happening at FOSS4G – and wonder – as an OSgeo community member and FOSS4G attendee would I be able to call any such behaviour out in a way which was respectful? Do I fall into those patterns myself? How can I do better next time? What are my internal biases, how do they manifest, how can I expose them and break them down? Equity of access – for people who can make the conference, what barriers exist? cost? (for example is the travel grant enough to get people from, say Africa, to the US?) childcare? would offering *good* childcare be an enabler for parents who may or may not have immediate family to help out? Stuff to think about going forward. Having never been a conference organiser, the second two points may be really hard to implement and at some point a compromise is needed, but could we do it as a community? I’d love to hear your thoughts. …and I really, really hope to make it to Dar Es Salaam – do I want to hear about solving African and global issues, African style? oh hell yeah I do!